Israel would often play around before a song. Making jokes, comments and chatter rarely counting off in a traditional way …. He’d just start playing. I would normally edit out and start on the down beat of the song. Its been many of years since I seen “Brother IZ” but just listening to him sing makes me remember the loving, kind, and gentle person he really was. I consider myself very lucky to have known him. Brother IZ also helped many children with personal problems and was there for them at all times via the radio, or personal phone calls and now he is there spritually for them. What a remarkable man! Once just before a concert at the Waikiki Shell, back stage there were a lot of kids peeking around the corner at IZ. The first thing was always his size … to a 5 year old it was always WOW with their eyes and month wide open. The kids were hidden behind a curtain when Israel spotted them and started to make funny faces. Everyone started to giggle ….. the kids came out and walked over to IZ, he reached down and pick one up with one arm and kinda rested him on his shoulder. Within a few minutes they were all climbing on IZ like a jungle-jim, laughing having the time of their life. Then israel walked out to 10 thousand people and performed for almost 2 hours…….. He invited the kids to sit in the wings of the stage…. they were so excited. IZ was truly a gift of God to us! and now that I know his relationship with kids – further confirmation that he was a remarkable man, that touched and continues to touch many lifes! This is a beautiful site and I’ll visit again and again. 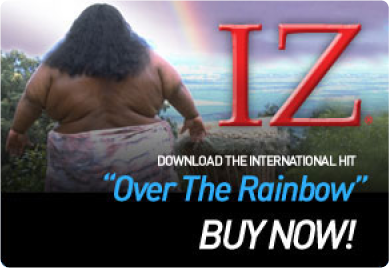 I discovered IZ after hearing him on the radio singing “Over the Rainbow/Wonderful World”, and bought all his albums shortly after. It’s only today that I’ve learned he was born the same year as me – what a loss to us all that he passed so young. I have always loved the music of Hawai’i since my first visit as a kid in 1968, staying wiht my wonderful aunt and uncle and my two kama’aina cousins, the lucky guys…those cousins grew up to be great surfers and slack-key players. Thanks for this awesome site, a fine tribute to a wonderful human being. I Love this website. Having the chance to listen in on some of the things that were said before the artist just starts playing, brings one in closer as to knowing how they feel about the songs they sing. It’s the same as when they finally started sharing the other takes on a film from the movies that you did not get to see before. The candid side of life of these artists. It’s great becuase you get to feel like you knew them just that much more. I Love IZ’s laugh, it’s a contageous one. Are there any other clips that would share alot more of that? I think the World NEEDS IT right now. “Laughter “IZ” the Best Medicine!” Hey! Can you imagine like an entire song of IZ’s Laugh? And calling it that? That would be SOOO Cool!!! Because of IZ’s voice being so songful there is no doubt in my mind that “There IZ a way ” (there’s another idea) to create a melodius song of laughter from IZ. Of course incorporating his music and some lyrics? Let me know if I’m ahead of myself here? I’m just having fun brainstorming and like the rest of me I can never waite to share great ideas that just come to mind. I have always been that way. I think that is why I am so in love with the Hawaiian’s. I think I was born on the wrong side of the planet!